Located in (in)famous West Auckland, Wellesley is Sirocco's current capital province. Almost entirely urban in nature, the province comprises entirely the city of Havilland, which previously served as capital for four days in 2013, and has done so again since February 2015. While Wellesley may not boast the natural splendour of Cambria or the unique culture of Zona, it has established itself as something of a technological powerhouse province. The home of the National Centre of Computing and the Institute of Scientific Research, the province has in recent years been connected to fast 4G mobile networks and VDSL Internet lines, which have been universally praised. Wellesley province does not have the prominence in Sirocco that others, such as Cambria and Zageta, may boast, but it is the character of Wellesley and its people to get about the business that needs to be done. 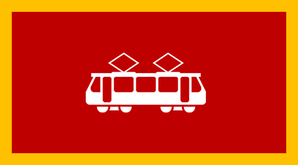 Wellesley's flag contains a tram on a red backdrop, representative of the trams (and the colour thereof) that served Auckland between 1902 and 1956.